Naveed Ayaaz who defends and co-operates with the Hizbees of Manchester and elsewhere, even conveniently remains silent upon a despicable racist for personal gain, as well as silence upon innovators such as al-Halaby and al-Ma’riby to maintain ties with his wayward allies, has now been comprehensively exposed by a brother in Nelson for the secret hatred he harbours against the Salafis. In a “secret” meeting that Naveed Ayaaz engaged in recently [essentially with a “forced” entry upon the brother (Nasser Hanif) who did not initially desire to allow him in – it would appear Naveed Ayaaz finds himself in a state of significant desperation to have to practically “insist” on being allowed in!] he exposed some sensitive information in his attempt to gain “justice” [! ], otherwise phrased as “an act of desperation attempting to win the brother over and convince him of his wayward methodology”, alhamdulillah the brother “saw through the deception” [!]. During the “forced” meeting Naveed Ayaaz was questioned regarding the imbecilic, idiotic, pathetic, mentally-challenged and in reality somewhat envious public outburst from none other than his right-hand man Abu Mus’ab Naman Yasin aka the crazed tweeter, whereby he tweeted that our noble brother Abu Iyaad’s visit to Nelson was “mere PR”(03/03/14)(another example of why he has earned himself the title of “crazed tweeter”… tweets first, thinks later). 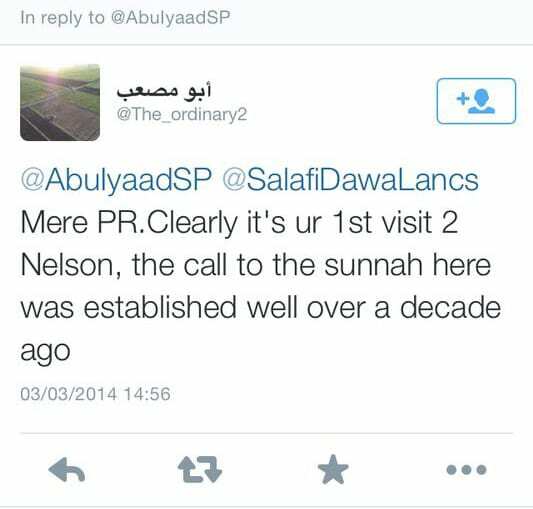 The Nelson brother states, “I asked about the tweet where it was mentioned the visit of our brother Abu Iyaad was a publicity stunt. I mentioned that I personally like Abu Iyaad’s delivery of lectures and how it suited my learning to which he (Naveed Ayaaz) said that this brother as well as others (referring to the Salafi du’aat) are “Super Salafis““. Firstly, we wonder why this Naveed Ayaaz was too cowardly to simply mention the names of the Salafi du’aat in his emotional statement depicting years of abuse he released recently? Since he holds this slanderous and envious opinion of the Salafi du’aat of this country, hence privately in “secret” meetings makes such despicable and degrading statements against them anyway?! Somewhat difficult to believe this individual claims he prefers to speak face to face openly [! ]; very open indeed for him to sit quietly and secretly in the house of one of the brothers and abuse and slander the Salafi du’aat of the U.K.
All the lectures on “good manners” and “etiquettes” Naveed Ayaaz is so fond of, yet forgotten so quickly when it comes to the abuse and backbiting of Salafis. Secondly, this highlights another pitiful reality of Naveed Ayaaz and his disgraced IslamNelson. Their inner hatred of the Salafis has become apparent, tweeting in a ridiculous child-like manner a statement full of envy and woeful evil suspicion that our invite of Abu Iyaad was a “PR Stunt”, may Allah guide these despicable individuals and protect us from their envy! It was in actual fact a very simple invite for the purpose of da’wah and to have a gathering of beneficial knowledge! We will therefore make an open request, or rather challenge, [since the accusation was publicly and pathetically made by the crazed tweeter Naman Yasin initially] for evidence to be provided of this pitiful claim of “P.R.” – attempts at fleeing will not be acceptable, a public retraction of this woeful and envious claim will be required, and if it is not forthcoming then let IslamNelson be known as envious slanderers. He says in this slander of his that he has “learnt”… we say, take your learning and dispose of it at a garbage collection site of your convenience. We are not in need of your “learning” you have gained from within the ranks of hizbees, defenders of innovators, haters of the scholars of the Sunnah who clarify the truth and refute their figureheads, those who cut the phone line on a great scholar of our time, harbourers of a secret racist…truly, we are not in need of such “learning” you have received from such degraded individuals. He says, “their peers in Birmingham”… we say, oh cowardly one! Cowardice prevented you from simply saying “SalafiPublications”? Or was it a case of recognising just how slanderous a statement it was that prevented you from naming anyone? Or perhaps blatantly mentioning the names was too damaging to the “innocent” image all such haters of the Salafis portray; those who cannot burden the reality of the Salafi da’wah in its pure form disseminated by the likes of SalafiCentre, and our brothers of SalafiPublications, al-Baseerah, Athariyyah and many others besides them?! 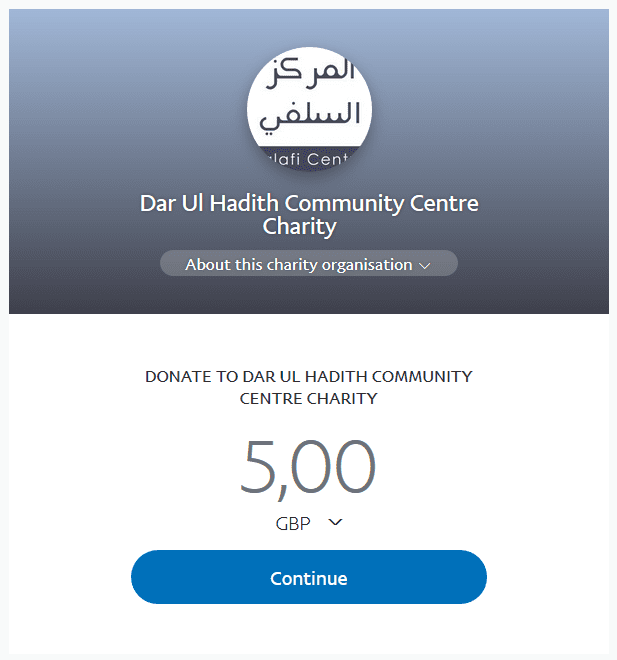 The false “innocence” that they are simply “getting on with da’wah” and “benefitting people” and not getting involved in “speaking about others” [! ]…was that image of “innocence” at risk of dismantlement had you mentioned names? Quite clearly the grass is not as green as they would have their followers believe, and neither is the sky a beautiful innocent blue. The hatred and envy of such individuals against the Salafis renders the grass a burnt-out dilapidated field resembling fodder, and the sky a smog-ridden, polluted poisenous air of dark clouds. Let it be known to Naveed Ayaaz, IslamNelson and all others who tread the same disasterous methodology as them, your grass will continue to burn and your skies will continue to be polluted…since the Salafis will not cease in teaching and disseminating the correct methodology, free of Hizbiyyah, free of silence upon innovators, free of allegiances to deviants. He states, “rather they want to cause chaos and discord between the people.”… we say, slandering and lying to this extent is quite baffling from an indivdual who claims an association to knowledge. To claim that the Salafis of @salafidawalancs, SalafiPublications and elsewhere are working not for the goodness and rectification of the people, but are rather out there to “cause chaos between them” we seek refuge in Allah from such hideous evil speech that emanated from Naveed Ayaaz. We would kindly request, what part of our 6 Events Seerah lessons were designed to “cause chaos” between people? What section of our current Tafsir of the Speech of Allah, Juzz ‘Amma is designed to “cause chaos” between the people? In reality, the claim is so absurd and based in fantasy that it requires little to be said regarding it. Such envy-filled speech of hatred against the Salafis has almost become a hallmark for such wayward individuals…perhaps the ill-effects of accompanying and aiding hizbees and defenders of innovators rubbing off. It is of little surprise therefore that when this speech was mentioned to Shaikh Mohammad Bazmool, he advised that this individual should be advised [which has occurred for years], if he accepts, alhamdulillah, if he refuses…then “he is to be warned against and abandoned”.